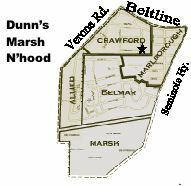 On Facebook: Type Dunn’s Marsh Neighborhood Association into the search box. The calendar and list of articles follow the first two articles about the mosaic murals. All articles by Mary Mullen unless otherwise noted. 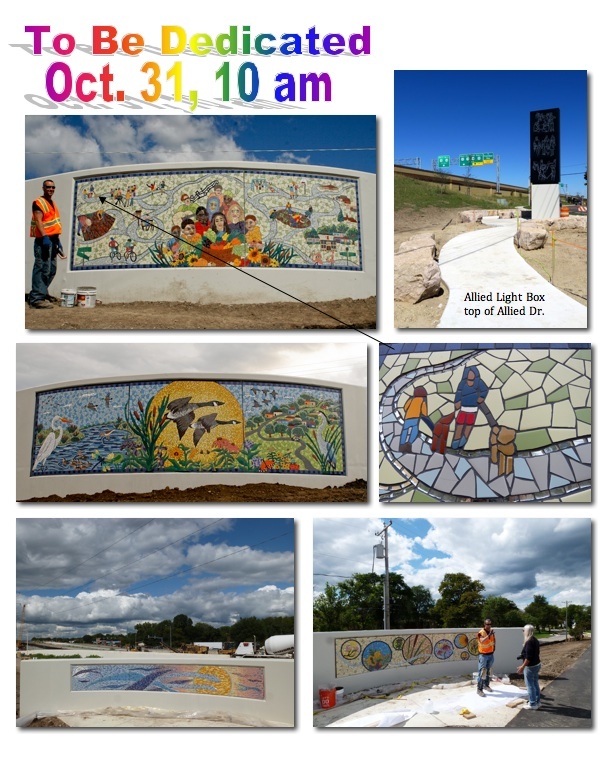 Rain or shine, everyone is invited to come to the formal dedication of the ped/bike bridge murals on Saturday, October 31, 10 a.m. It’s a project that has had a great deal of neighborhood input, and a time to recognize all the hard work - and pleasure - that went into creating a destination location. Dignitaries, volunteers who worked on the murals, and the entire neighborhood is invited to gather up at the murals adjacent to Britta Parkway. Come up the path from Whenona or from the other side where the path starts at Niemann Place. Parking is available on Whenona Drive and Axel Avenue. Artist Marcia Yapp, Department of Transportation folks, and contractors who helped make this project a reality as part of the Verona Road construction will be there. Installer Jared Filip has been invited, and probably our alder Mauric Cheeks will lend his presence as well. Come and see the murals close up and give your blessing to the finished project. Mosaic volunteers and any other folks attending the dedication are invited to share beverages and snacks at Prairie UU Society after the formalities. Prairie is located a block down Whenona at the corner of Whenona and Crawford Drives. As many of you know, I moved out of the [mosaic] project space on the [Beltline] Frontage Road the first weekend in May, taking the supplies and the remaining unfinished Frontage Road mural to my home. Before moving out, the two completed bike-path murals were transported to the DOT field office, where they… remain[ed] until the installation [in September]. The blue tile for the Frontage Rd. mosaic sky arrived mid May and the rest of that month was spent finishing up the necessary work for the right and left side of the mural. 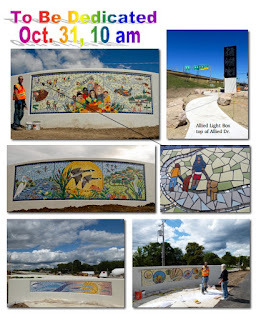 The final template for the Frontage Road mosaic (template scene is the sun, geese, cattails and flora), began in June, and was finished by the end of the month. The pieces for the Frontage Road mosaic were then transported to the DOT field office the first week of July. The final mosaic mural - facing Britta Parkway - began on July 6 and took a month to complete. Due to the limited space in our basement, and my hope to have all the work complete by the end of July, I decided against inviting volunteers over to help with the remaining work. I hope you all understand. I haven't been flying completely solo, as my husband Maury (crazy paver extraordinaire), helped when he could and visiting family (Seth, Melissa and Calvin), laid some mirror for the pathway. That being said, the Dunn’s Marsh Community Mosaic Murals [were] ready to be installed! YEA! I want to express my heartfelt gratitude to all of the wonderful volunteers on this project from beginning to end. You all shared in the creation of the Dunn's Marsh Mosaics. These murals were very detailed and complex and yet everyone who participated in this project was willing to learn, added their own touch, joined in the communal atmosphere of each session and rose to and went beyond my expectations. Many of you came on a regular basis - I miss those weekly gatherings, they were focused and fun - thank you for your consistent work and your friendship. I have never been so proud and so grateful to a group of volunteers. I hope every person who contributed in some way to this project understands what we have accomplished as a community. You’ve all helped in bringing more beauty into the world. Bravo! … I hope you all have savored this amazing summer. I look forward to celebrating the community that was created while working on this project together. Kindly, and with a huge jump for joy! 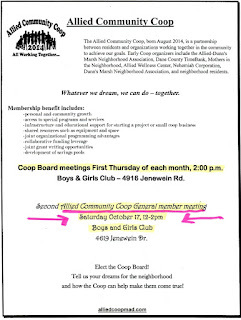 Thur., Nov. 5, 2 pm - Allied Community Co-op Board meeting (first Thursday of every month), Boys & Girls Club Gym, 4619 Jenewein.. Sat., Nov. 14, 5-8 pm - Allied Recognition & Fund-Raising Dinner, Boys & Girls Clug, 4619 Jenewein. 8 - Cannonball Path Completed to Fish Hatchery Rd. Although grocery store issues dominated the Annual Meeting of the Dunn’s Marsh Neighborhood Association on October 15, a nice sandwich and soup meal preceded the meeting, a rotating slide show played throughout the evening, all attendees had a chance to introduce themselves, and several other items of business got taken care of. Routine business included approving the minutes of the 10/9/14 annual meeting and accepting the treasurer’s report. At the time of the meeting, the DMNA treasury held $1,124.16. Several bills are outstanding which would bring the treasury down to about $880. Most expenditures were for marketing (copy cards and web page) and supporting the activities of the association such as the annual picnic. Income was primarily from dues and donations. Both the Allied Community Co-op (ACC) Board President Cassandra Sonko and 10th District Alder Maurice Cheeks spoke movingly about the need for the grocery store and efforts that are underway. Several others spoke out favorably as well. Neighbors were very strongly urged to join the ACC and then participate actively to make the grocery come alive rather than to just sit back and let others continue to do the work. DMNA members voted to change the DMNA by-laws. One change clarifies that dues remain in force until changed at an annual meeting. Another change allows members to be notified of membership meetings not only in writing but by e-mail, phone, or in person. The evening ended with caucuses from the 4 areas of the neighborhood selecting their representatives to the Council. Another article lists the Council members who were chosen. Many thanks to all who attended including Alder Maurice Cheeks, Madison Police Officers Stephen Mackesey and Manny Gatdula, members of the Allied Community Co-op, the volunteers who took notes for meeting minutes and helped check in attendees, all those who brought food, other interested residents, and the 4 very well-behaved children. We are renewed for another busy year serving the neighborhood: ten DMNA Council members were chosen by those who attended the DMNA annual meeting, October 15. Every part of the neighborhood is represented by the people who were selected by caucuses from the 4 areas Half of the 10 are new including 2 who joined the previous Council at its last meeting in September. Here’s your 2014-2016 Neighborhood Council with new Council members shown in bold type. The Council still has room for 2 more members. Wouldn’t it be great to have another man or two join up and/or have 2 more representatives from the Allied area? Anyone interested in serving should contact current President Mary Mullen (See masthead for contact information) and then attend the November 12 organizational meeting of the Council. The meeting will be held at 2010 Whenona Drive (Prairie UU Society), 7 pm. This Council will serve until the next annual meeting in September or October 2016. 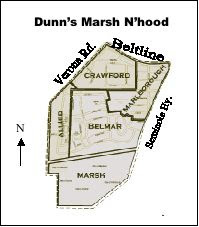 Don’t call the Dunn’s Marsh Neighborhood a do-nothing organization. Far from it. Here’s a summary of its major activities and accomplishments during the past year. The most active participants in each activity are listed as well. 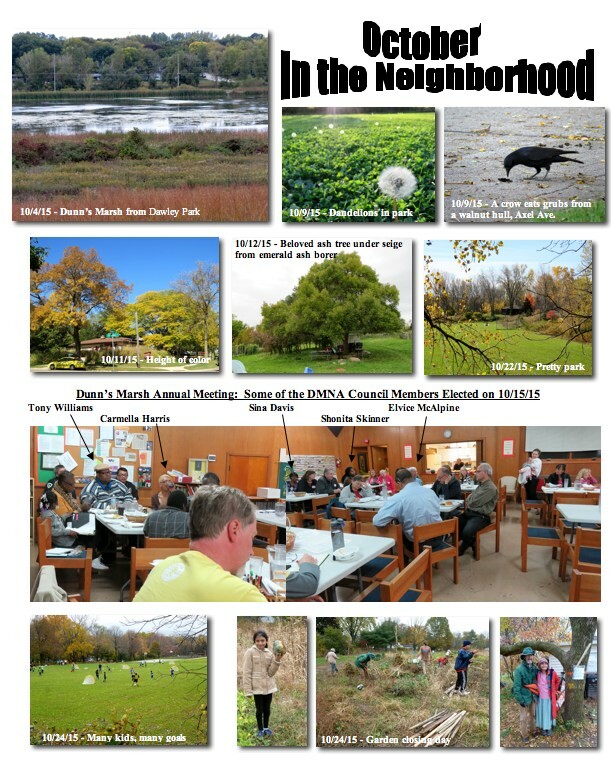 DMNA Council met every month Nov. 2014-Sept. 2015, and members kept abreast of developments in the neighborhood, participated in meetings and events, and contacted city staff and the supervisor of the Verona Road project about neighborhood issues. (Council members: President Mary Mullen, VP Tony Williams, Sec. Karen Walters, Treas. Yannette Cole, Thea Bach, Ann Marie Hughes, Denise Williams, Lucy Blue, Heidi Figueroa, Rachel Potter, and Joe Maldanado. As of the 9/10/14, we have 2 new members, Carmella Harris, and Shonita Skinner.) Heard presentations by/about Urban Tree Alliance, Allied Community Co-op, grocery store efforts, water resources sustainability, Fit2Go Van, and Green Madison. Co-sponsored Make Music Madison with Prairie UU Society & provided volunteers to help run the day, 6/21. (Mary Mullen, Yannette Cole, Caron Beaudoin). Neighborhood performers included Mary Mullen, Jesse Cole, Cindy Harrington, and Dan Neuhaus. You might have heard it on the nightly news already: Department of Transportation folks feel that a bigger Beltline is all that will work to alleviate rush hour gridlock on the highway that forms our neighborhood’s northern border. A northern by-pass won’t do much, if anything. A southern by-pass wouldn’t do enough. However, there might be more to learn, and there’s definitely a chance to register your thoughts about plans for the Beltline. Here’s the Wisconsin DOT’s notice of Public Information Meetings (PIMs), shortened to include only meetings in or close to the neighborhood and at the downtown library. Madison’s Beltline: Learn what’s in, what’s out and what’s ahead as WisDOT continues its PEL study to determine potential future improvements to the Beltline. Plan to attend one of the following Public Involvement Meetings (PIMs). By the way the PEL study is the Planning and Environment Linkages (PEL) Study <http://wisconsindot.gov/Pages/projects/by-region/sw/madisonbeltline/process.aspx> . 5:30 – 8 p.m., presentation at 6 p.m.
7 – 9 a.m., presentation at 7:30 a.m.
11:30 a.m. – 1:30 p.m., presentation at 12:15 p.m.
Last summer, Madison Metro Transit considered changes to several bus routes including Route #59 that runs through our neighborhood. The route includes stops near businesses at Co. PD and Seminole; the Star Cinema; Aldi’s, Super Target, and HyVee near Co. PD; and Copps and HyVee at Westgate. It is a weekend only service. 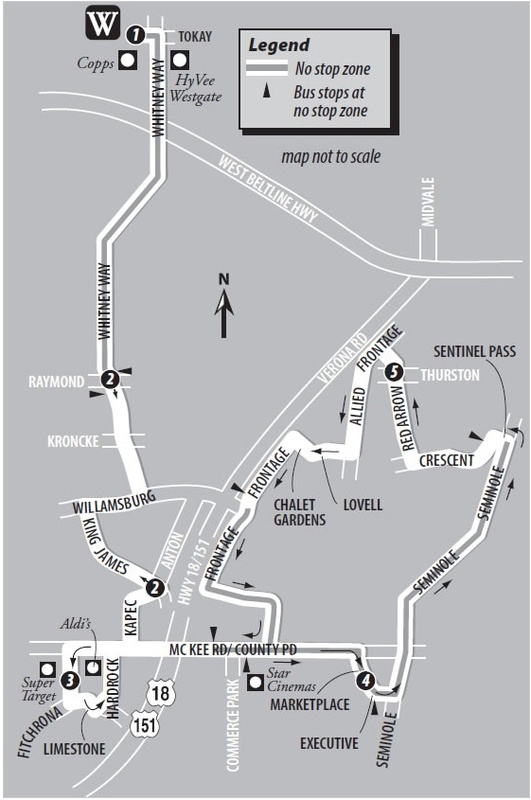 The changes to Route #59 include minor schedule adjustments and moving time point #4 from Crescent and Sentinel Pass to Exectuive and Marketplace. Buses will use the newly finished Spoke and Sprocket streets to provide direct service to and from the Allied Drive/Dunn’s Marsh areas and Star Cinema. Finally! The Cannonball Path was completed this summer. The last leg - from the bridge over the Beltline near Culver’s to Fish Hatchery Road - is open, and it’s NICE! Bicyclists and walkers can get on the path in our neighborhood from 3 different places: below the high bridge near Allied Drive at the bike roundabout, from the Apache Pond bridge below Crescent Road, or from Seminole Highway. The Cannonball is a wide blacktop paved bikeway throughout its entire length. The rest of this article, from the City of Madison, is about Phase 5 of the project with reference to a “Phase 6” east of Fish Hatchery Road. This project is a shared-use (bicycle and pedestrian) path connecting the new shared-use bridge over Beltline Highway (Phase 3) to Fish Hatchery Road. This is the final piece of the overall 4+ mile Cannonball Path as originally envisioned. This is a major new commuter route linking areas of Fitchburg and Arbor Hills neighborhood with downtown Madison. The overall Cannonball Path project is a joint effort between Madison and Fitchburg, with land acquisition partially funded by Wisconsin Department of Natural Resources. 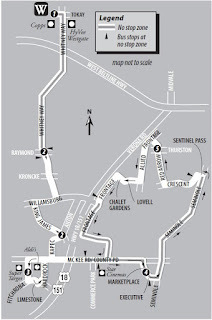 The Cannonball Path connects neighborhoods with parks, schools, major conservancy areas as well as retail, commercial and employment centers. It also connects to the Capital City Trail, Southwest Path, Military Ridge Trail and Badger State Trail, making it a key component of the regional network of paths for recreation as well as transportation. The construction contract includes substantial length of new watermain, not directly related to the path but intended to increase reliability for this portion of the City. Total length of path is 3000 feet from the north end of the Cannonball Path Phase 3 (Beltline Bridge) to Fish Hatchery Road. Project includes a small bridge over an unnamed waterway and retaining wall along UW Aboretum Pond 4, a major storm water management and natural area. Total project cost is approximately $1.5 Million, including $170,000 for the bridge, $155,000 for sanitary sewer work related to the path and $248,000 for water main construction not directly related to the path. The design engineer for this project was Tony Fernandez in the City of Madison Engineering Department. The City Construction Engineer was John Fahrney, and the Inspector was Eric Hoel. Neighbors and other supporters of the Allied Community Co-op’s proposal for a co-op grocery store turned out at City of Madison meetings that considered the $300,000 grant proposal. The proposal is supported by City staff as well. 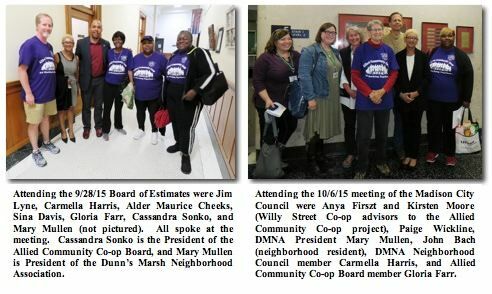 Below are photos of those who came to the Board of Estimates meeting on September 28 and the City Council on October 6. Getting a store in place will take time. It will need a solid business plan. It will probably be smaller to start with (not Walgreens size). We need to be patient but active in making it happen. We discussed the potential of starting a buyers club first in order to meet some immediate needs in the neighborhood. Willy St Coop started as a buyers club. Willy St Coop has expressed a willingness to help out with orders. Most were in favor of this. So more to come with this option. Not 100% sure about who can join ACC [Allied Community Co-op], but several of us did (because we're residents in Allied/Dunn’s). They, with the help of the UW Center for Coops, are working on many issues for the neighborhood. Not just the lack of nutritious and affordable food in the neighborhood. This topic has taken front and center with the city RFP [Request for Proposal] in play. On a side note, I learned that the city has a city-wide Cooperative business business initiative that it’s looking to start. This would be a $600k/year initiate to support business cooperative development throughout the city. Cool! 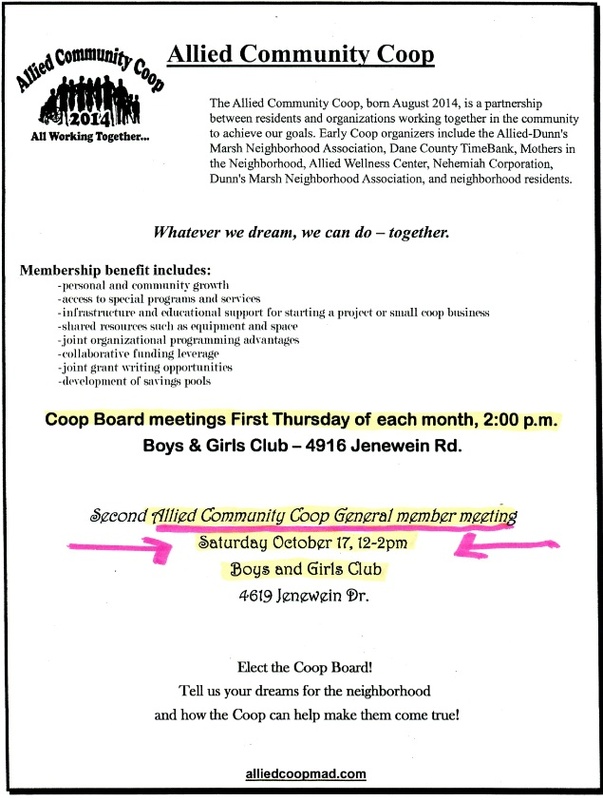 Anyone interested in seeing a community food coop in our neighborhood can support ACC's proposal by attending and registering in support of funding the project at the November 10 Madison City Council meeting. See the article below. The last step in securing funding for the Allied Community Co-op to work toward getting a grocery store in our neighborhood is coming up on Tuesday, November 10. Sign the form to support (or oppose) the agenda item concerning the grocery store in our neighborhood, and indicate whether you wish to speak or are registering only and don’t wish to speak. Registrants may speak 3 minutes to express why it is important to you, when the item comes up. You can quietly leave afterwards. This gives the Council a visual affirmation to continue with the grant acceptance. Dane County Supervisor Kyle Richmond (District 4, that includes the Madison area of the Dunn’s Marsh Neighborhood) announced October 1 that he will not seek another term on the Board of Supervisors. Richmond was first elected to the Dane County Board in 2002, and has served on three standing committees, as well as the Food Council, Park Commission and several other County bodies. He was elected Second Vice Chair for the current term, and chaire the Environment, Agriculture & Natural Resoureces Committee for four terms. In his Biennial State Budget Governor Walker proposed privatizing our local Aging and Disability Resource Center (ADRC). At Dane County we found this unacceptable. Our local ADRC is a one–stop-shop that connects seniors and the disabled with critical services available to them through various federal, state and community resources. In 2014 alone, the Dane County ADRC had 23,897 consumer contacts helping thousands of Dane County’s disabled and elderly. Governor Walker’s budget directed the Department of Health Services to contract with a private provider threatening the current successful locally focused “one-stop-shop” model. The bill also would have eliminated local input and oversight. The ADRCs are one example of government working well. They help people get the resources they need and navigate through bureaucratic red tape. After months of work, I am proud to tell you we fought this budget proposal and we won. Our local one-stop-shop will continue to make those critical connections to services. As Dane County Executive, I will continue to work and support our ADRC. Our commitment to our seniors does not end there. We have many other important services for seniors in Dane County. For example, I created a new Elder Benefits Specialist position to ensure our seniors have timely access to services and information through the ADRC. Since last year, our Elder Benefits Program has seen a marked increase in the number of seniors needing services and this position will help meet that growing need. The county partners with the federal government and private donations to provide $1,466,086 to ensure our seniors continue to receive warm meals, served with smiling faces. Across Dane County we have 26 county supported senior centers. Dane County has many things to offer citizens of all ages. We enjoy an incredible quality of life including world-class bike paths, beautiful lakes and scenic county parks. In fact, our quality of life is so wonderful we are continually nationally recognized as a great place to retire, to raise a family and one of the safest places in the country. I am very happy to be able to deliver such good news but we could not have done it without you. Thank you to all of you came who out to the hearings, registered your concerns and/or called your legislators. We must continue our vigilance and ensure that our seniors’ golden years are enjoyed and their services remain protected. Love Jimmy Fallon? Love Lip Sync Battles? Don’t miss the first annual Lip Sync for Schools! Let your inner rockstar shine and raise funds for public education at the Foundation for Madison’s Public Schools’ newest fundraiser. Based on popular skits from “The Tonight Show with Jimmy Fallon” the event features lip sync battles between community leaders with the audience determining a winner. The night also features a silent auction, photo booth, food and drink. We hope you’ll join us on Friday, November 6 from 7-11pm at the Brink Lounge. Tickets are $40 and support the Foundation’s work in providing creative and innovative programs to enrich the education of all Madison’s 27,000 public school students. Get yours today at lipsyncforschoolsmadison.splashthat.com before they’re gone! Want to get on stage? Anyone is welcome to perform! Contact Valerie Chesnik at vchesnik@fmps.org or 237-7721 for more information. Have you ever wondered why someone built a road across Lake Mendota’s North Bay? Or perhaps you want to know when a sea serpent was last spotted, or if your friend really did swim across the lake many years ago. 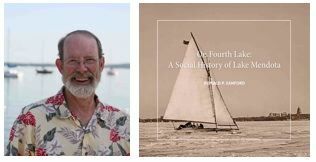 The answers to these questions, and many more, can be found in my recently published book, On Fourth Lake: A Social History of Lake Mendota. It is the story of the people, places and events that have shaped the shoreline of Lake Mendota, Madison’s greatest lake, as we know it today—the story of Native people, settlers, iceboaters, sailors, fishers, hunters, explorers, politicians, entertainers, lifeguards, boat captains, inventors, scientists and Olympians, much of it in their own words. I spent over a decade preparing this social history of Lake Mendota. My work combines the personal experiences of people who lived, worked and played on the lake with the events that shaped Madison, the Badger State and the nation. The first book of its kind, On Fourth Lake takes you on a guided tour around Lake Mendota, looking at the lakeshore from the water. It is richly illustrated with more than 500 maps, newspaper articles and photographs. Many of the images were sourced from private collections and have never before been available to the public. This book is a must-have for anyone who spends time on Lake Mendota or has an interest in the history of Madison and Dane County. A Lake Mendota mariner, I am a member of the Four Lakes Ice Yacht Club, past Commodore of the Mendota Yacht Club, and Commodore of the International Nite Ice Yacht Class Association. I hold a 100-ton Masters License, Great Lakes and Inland Waters. Since 2006, I have been a captain for Betty Lou Cruises in Madison. I also host Madison School & Community Recreation’s (MSCR) Lake Mendota celebrity cruises. You may order On Fourth Lake online at: LakeMendotaHistory.com. The following Madison book and museum stores also carry the book: University Book Store, A Room of One’s Own, Mystery to Me, and the Madison Museum of Contemporary Art museum store. Visit the website for a list of upcoming book events. I can be reached at Don@LakeMendotaHistory.com, (608) 225-7520. 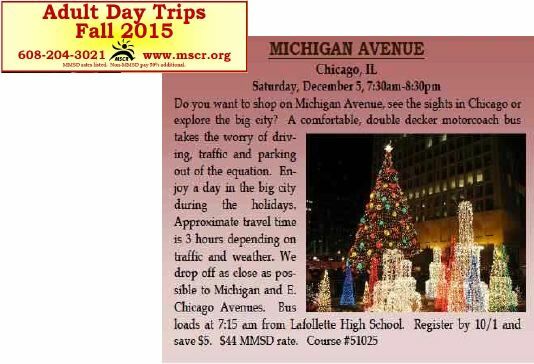 If you live in the Madison Metropolitan School District, this trip to Chicago on December 5 is available to you for just $44. It seems that a month doesn’t go by without news of another hack of personal data on a large scale. This news is yet another reminder that just about everyone, whether you shop with credit or debit cards, pay taxes, have health insurance, or work for the federal government, is at risk of a data breach. from the next one. Our tips will help you avoid, detect and deal with identity theft from a data breach. Please take a look here and share with your friends and family. Editor’s note: There are pages of news that could go into this issue of the e-News, but mainly we want to just remind you of the Annual Meeting of the Dunn’s Marsh Neighborhood Association. You should have received a flyer about it at your door. ALL neighborhood residents are invited to come to the meeting. Other than a list of important dates, additional news will wait until a later date. Prairie UU Society, 2010 Whenona Dr. ARTICLE X - DUES Dues may be assessed only by a majority vote at the an annual meeting and remain in force until changed at a subsequent annual meeting. 3. Members shall be notified in writing or by e-mail, phone, or in person at least three days prior to the meeting. Neighborhood Council: Allied, Belmar, Crawford, and Marlborough. Sat., Oct. 17, late at night - Eastbound Beltline traffic will shift to new eastbound lanes. Wed., Oct. 28, 6:30 pm - Neighborhood Book and Movie Club, 1905 Danbury St. - The club will discuss Orphan Train and see the movie. Bring food to pass. Open to all. Tues., Nov. 10, City Budget Night, 5:30 p.m. City-County Building, Room 201. Final approval of grocery store grant report.